Ardent users are clamoring for quick upgrades to Apple's Mac Pro, while an unstable hardware timetable for the high-end desktop has raised concerns about the company's commitment to professional users. The Mac Pro was last upgraded in July 2010, when Apple announced models with up to 12 processing cores based on Intel's Xeon server chips. Mac Pro users now want the models upgraded to Intel's recently announced Xeon E5-2600 chips to keep up with the increased horsepower required for tasks like video editing. Apple's popularity has surged in the last few years with iconic consumer products like the iPad and iPhone and shipments of Mac computers are also growing. But Mac Pro desktops, which are largely aimed at creative professionals, are quickly becoming obsolete. Some users have moved over to iMacs with the latest Intel Core processors, which in some cases outperforms Mac Pros. As Apple gravitates to the consumer market, the lack of a Mac Pro upgrade has also raised questions about the company's hardware and software commitment to professional users. Apple killed the Xserve server in late 2010 because the product sold in low quantities. Mac Pros ultimately took on the additional responsibility of being servers. But users hope the top-end Mac Pro desktops live on and get at least one more upgrade to Intel's latest Xeon E5-2600 chips, which have up to eight processor cores and PCI-Express 3.0 support. A dual-socket Mac Pro based on the new chips with 16 processors could potentially outperform iMacs and store more data. Apple has not announced plans for a new Mac Pro. The company does not comment on future products, a company spokeswoman said. Apple still has a big audience of creative professionals waiting for a Mac Pro upgrade, said Gary Huff, founder of Rusty Auto Productions in Austin, Texas. But with the iOS infrastructure taking preference and Mac Pro perhaps a smaller portion of overall product sales, Huff wondered whether Apple's once proud legacy of serving creative professionals is as necessary today to the company's bottom line. "One of the questions is do they care about the professional market," Huff said. "Personally I hope to refresh the Mac Pro. I want to buy one." Mac Pros are widely used for multimedia creation and editing with software tools from Apple, Adobe Systems and Avid. The hardware flexibility provided by Mac Pro is valued by users, who can get more storage and swap hardware and internal components such as graphics cards. Users also want the Mac Pro to be upgraded for the Thunderbolt connector technology, which will provide expansion capabilities for peripherals such as external storage devices and monitors. Thunderbolt is already available in Mac desktops and laptops and supports the DisplayPort protocol for displays and PCI-Express 2.0 for peripherals such as external hard drives. The Mac Pro will remain an important product in Apple's high-end computing lineup, said Peter M. Fine, who runs the consulting firm FinePeter Consulting in New York. He recommends Mac Pros to clients who need high-end machines or require PCI-Express slots or the SCSI (Small Computer System Interface) bus to connect components inside a computer. "I think it is essential that Apple adds any new chip architecture to the Mac Pro in order to keep it in the upper echelon," Fine said, adding that Thunderbolt is needed on all Mac hardware. But until the upgrade comes, he is recommending high-end iMac models with quad-core processors to replace some Mac Pro towers for his clients. The iMac supports up to 16GB of RAM and comes with 21.5- and 27-inch Apple displays. The overall package is less costly than a Mac Pro for Fine's clients, who are in desktop publishing, marketing communications or computer graphics, and do not need expansion cards or multiple internal hard drives. "With the corresponding reduction in RAM cost, the Mac Pro has truly moved to niche market use," said Fine, who is also a cofounder of the Metropolitan New York Macintosh Alliance (MetroMac). Beyond hardware, Apple customers also had a rough time converting to the latest Final Cut Pro X video-editing software that was released in June last year, said Rusty Auto Productions' Huff. Compared to the predecessor, the latest version was not directed toward "uber professionals" who would invest in the Mac Pro, Huff said. The software is getting better, but users who work with a lot of multimedia under deadline pressure may instead want to upgrade from Mac Pro to faster Windows workstations with Adobe or Avid tools, he said. Apple's lax approach to the Mac Pro has opened an avenue for PC makers like Dell and Hewlett-Packard to compete in the workstation market, said Alex Herrera, a senior analyst at Jon Peddie Research (JPR). 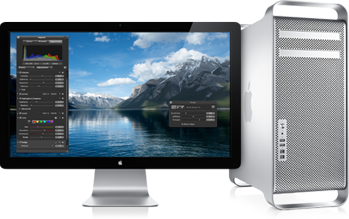 Taking advantage of the Mac Pro uncertainty, Dell earlier this month sponsored a discussion on how to switch from Final Cut Pro on a Mac to Adobe Creative Suite 5.5 on a Windows workstation. Final Cut Pro is Mac-only, while Avid and Adobe tools work on Windows and Mac OS, providing users more flexibility to use either platform. Apple bristles at the notion of comparing Mac Pros to generic workstations and doesn't provide shipment numbers for the product, Herrera said. JPR this week issued workstation shipment numbers for last year's fourth quarter, but did not include Apple's numbers. Herrera estimated that Mac Pro shipments are likely in the ballpark of workstations shipped by HP, which had a 41.3 percent market share in the fourth quarter, and Dell, which held a 33.4 percent share. But users agreed that Mac Pro should be kept alive, especially with a large number of creative professionals and facilities relying on Apple hardware to support video, animation and music composition applications. Apple should not cordon off its high-end offerings at the iMac and will need powerful Mac Pro computers to support the growing cloud infrastructure being built around the iPhone and iPad, said Craig Seeman, owner of Third Planet Video, a company in Brooklyn, New York, that focuses on video production and live streaming. The machine will be useful in the creation and rendering of graphics to mobile devices, Seeman said. Apple also tends to push forward on thinner and sleeker hardware designs, and the company could be looking to overhaul the Mac Pro, Seeman said. "If they wanted to kill it, they would've pulled the plug already," Seeman said. "I can't think of Apple dropping the ecosystem even though it may not be the most profitable."